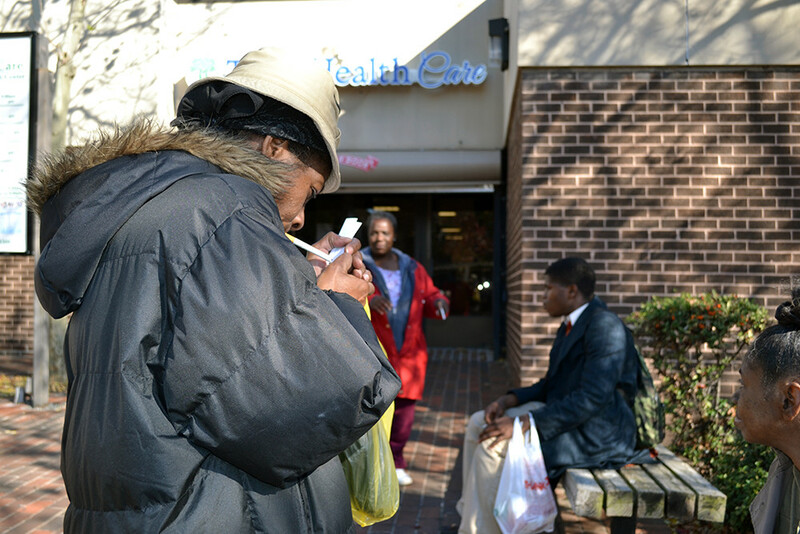 A woman lights up a cigarette outside the Total Health Care clinic on Division Street in West Baltimore. Capital News Service photo by Amanda Eisenberg. This is the first article in a five-part series from the project “In Poor Health” produced by Capital News Service and Kaiser Health News. It explores why Baltimore’s world-renowned health system is struggling to keep Freddie Gray’s neighbors — some of the city’s poorest residents — from getting sick. Sharlene Adams, on the porch of the rowhome she rents in West Baltimore, relies on the city’s unpredictable public transportation network to get to health appointments. Capital News Service photo by Rachel Bluth. In a city rich with world-famous hospitals and renowned medical researchers, Sharlene Adams complains she has trouble finding good health care. Adams, who is 55, rents a rowhouse in West Baltimore, not far from the blocks besieged by rioters last April. Her monthly income is a disability check of about $700 — putting her below the federal government’s poverty threshold. And poverty creates barriers to the complex and rapidly changing health care system that more affluent people don’t face. Adams is disconnected from a network of medical institutions that increasingly rely on computers, call centers and online ordering. She has no computer and no credit card. Her cellphone, issued by Medicaid, gives her 250 minutes a month at no charge, but it’s not enough time to let her wait repeatedly on hold to talk to a doctor or a nurse. She sometimes has a landline she can use. But for other people she knows, the Medicaid phone is their only one. 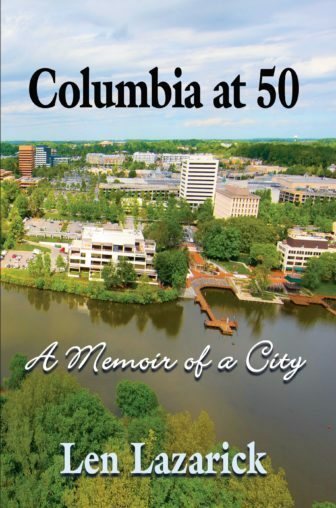 Adams has no car, so she cannot drive to a downtown clinic for a routine appointment or to suburban Pikesville for the colonoscopy her doctor has recommended. She relies on the city’s unpredictable buses. Even middle-class patients with much more money complain, as Adams does, that doctors are always in a rush. But Adams’ complaints are magnified by the problems that poverty creates. She has little confidence her doctor is even listening to her — or, just as annoying, little confidence that she’s going to understand what her doctor is saying. And she faces yet another obstacle: If doctors hear you’ve ever been on drugs — as Adams, like many of her neighbors, has — you get no respect, she says. The doctors stop listening. All the hurdles that Adams faces help explain why residents of Baltimore’s poorer neighborhoods are plagued by rates of heart disease, diabetes, obesity and hypertension higher than in wealthier parts of the city. Those conditions lead to lives that are shorter and sicker than the lives of people who live in more affluent parts of town — evidence that the health care system is failing the city’s poor. Public health researchers have long documented the city’s health statistics and their grim underpinnings. But the health care system, despite countless experiments with new approaches, including pilot programs that come and go, still hasn’t found a way to knock those numbers down. In Roland Park, where the median household income is nearly $107,000, life expectancy is more than 84 years, according to the Baltimore Neighborhood Indicators Alliance. But in some poorer Baltimore neighborhoods, it is as low as 66. In Greater Rosemont, Sharlene Adams’ neighborhood, median household income is less than $28,000 a year, and life expectancy is 70. Just a few blocks away is the boundary of Sandtown-Winchester/Harlem Park, where Freddie Gray lived. Gray, who was 25, suffered a spinal injury sometime after he was arrested April 12, 2015. He died a week later, and riots erupted in West Baltimore on April 27, the day of his funeral. Six police officers have been charged in connection with his death. In Gray’s neighborhood, the median household income is less than $25,000 and life expectancy is 69.7 years. But how long people live is just one measure of health, doctors say. People are suffering with illnesses that could have been prevented altogether — Type 2 diabetes in children, high blood pressure, heart disease, strokes — all arising at younger ages than in the population as a whole. Neighborhood doctors with solo practices are rare in West Baltimore today, just as they have become rarer in most cities. Residents like Darlene Parker, who lives next door to Sharlene Adams, complain they have to settle for clinics — where they are always seeing a different physician — or must travel even farther from home to find a doctor they’re comfortable with. Hospitals and clinics are exploring new ways to keep people healthier — and out of emergency rooms. The state in 2014 imposed “global budgeting,” a system meant to prompt the hospitals to help improve primary care and keep patients away from more expensive in-patient treatment. With global budgeting, hospitals no longer receive payment for every test or procedure. Instead, the state gives hospitals a set budget every year, and if hospitals reduce costs, they can keep any unused funds. But the health care system still doesn’t work for many of Baltimore’s poorer residents. Dr. Arethusa Stevens Kirk, a pediatrician, says poverty makes everything difficult. Kirk is vice president of medical affairs at Total Health Care. She says she tells her patients to come back for checkups and follow-up appointments but so often knows they won’t return on time or at all — not because they don’t want to, but because it’s just too hard. Kirk’s colleagues at Total Health Care agree that even patients who are employed may have jobs that don’t allow workers to leave for a couple of hours to see a doctor. Or they may be working at more than one job and have no time to spend at a clinic. Or they’ll risk taking time off, and hope the boss doesn’t mind, to get a child to the doctor but not themselves. For Sharlene Adams, small frustrations become big hurdles. She is diabetic, bipolar, a former drug user. She has two bad knees and a cataract in one eye. She’s supposed to be monitoring her blood pressure and eating better. But she says the food doctors suggest is too expensive. And she says she didn’t really understand her doctor’s instructions on using insulin. Her doctor wants her to have a colonoscopy in Pikesville, a Baltimore suburb, but Adams doesn’t know how to get there. How would Sharlene Adams change Baltimore’s health care system? Better transportation, she says. More choices. Have insurance companies allow access to more doctors. Middle-class families drive to medical appointments and pharmacies and, if they like, order supplies online. That’s less true in Freddie Gray’s part of the city. “No one is shopping online,” says Joy Twesigye, director of Baltimore Healthy Start. “If you don’t really use an actual bank,” Twesigye says, “then you’re probably not going to have a debit card. You could be using prepaid Visa cards … but then there’s a fee for every last thing.” So those cards will more likely be used for food, she says. Lack of access to technology, including computers or mobile devices, creates limits beyond the inability to shop online. Alicia Davies, who ran a health screening program in West Baltimore neighborhoods for St. Agnes Hospital, says she would send letters, make phone calls and write emails to remind her clients about follow-up appointments. But many of the women St. Agnes was trying to reach don’t have computers, so they don’t read email. Some don’t even have permanent addresses, Twesigye says. They’re living temporarily with friends or relatives so they may never see an envelope that arrives for them. In Baltimore’s City Council District 7, which includes part of Sandtown-Winchester, 47 percent of people live in a food desert, a place without easy access to healthy food, according to a June 2015 study conducted by the Johns Hopkins Center for a Livable Future and the Baltimore Food Policy Initiative. CNS reporters Lauren Burns, Rachel Bluth, Rachel Greenwald, Amanda Eisenberg and Nora Tarabishi contributed to this article.